Malik Goes to School: Examining the Language Skills of African American Students From Preschool-5th Grade synthesizes a decade of research by the authors, Holly Craig and Julie Washington, on the oral language and literacy skills of African American children from preschool to fifth grade. Their research has characterized significant influences on the child's use of AAE and the relationship between AAE and aspects of literacy acquisition. The research has also led to the characterization of other nondialectal aspects of language development. The outcome has been a culture-fair, child-centered language evaluation protocol. This very readable volume will be important to students, clinicians, and teachers, learning about and working with, African American children. The book has direct relevance to academic planning, clinical decision-making, curriculum development, and educational policymaking. Contents: W. Wolfram, Foreword. Preface. Who Is Malik? An Overview of Research on Child AAE. Our School-Based Participants and Sampling Procedures. Features of Child AAE. Distributional Properties of AAE in the Early Grades. Nondialectal Expressive and Receptive Language Skills. Evaluating Language at School Entry. African American Children in Academic Distress. Relationships Among Language and Literacy Skills for African American Students. Summary and Final Thoughts. Appendices. "Craig and Washington apply a reliable set of procedures for conducting sociolinguistic research in culturally diverse communities. 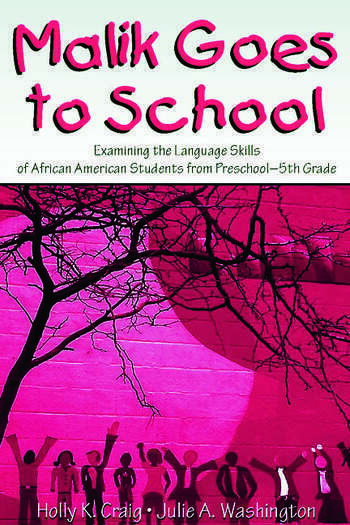 The book can be read as an application of sociolinguistic knowledge to enhance the educational programs with African American children....this work makes a concrete contribution in the design of prevention programs that focus on dialect shifts and language skills." "The authors provide a framework for implementing appropriate services for African American children in schools. This is a excellent resource for all professionals working with African American students in an educational or clinical setting." "The sophistication of these authors in linguistics, language acquisition, and language disorders means that their characterization of AAE is both rich and original. They provide an excellent overview of the importance of approaching AAE on its own terms, rather than treating SAE as the reference standard and then simply cataloging the ways in which AAE differs from it. They provide a persuasive rationale for using the term 'AAE' rather than other terms that have been applied to the language variations produced by African American students, and they emphasize that the term 'dialect' as applied to AAE must be understood to encompass a comprehensive set of language variations resulting from creolization processes rather than a limited set of regionalisms or a reduced version of SAE."